It’s the dead of winter; no outward sign of earth’s renewal in northern climes. But there are winters other than that of climate. Mocan’s image conveys the inner winter when even the memory of the memory of laughter is not accessible. Biblical scholars cannot decide how these “strengthen” verses got inserted in the Isaiah scroll at the point where the text is about destruction. (Check out the preceding chapter: the stench of corpses, brimstone and pitch.) The gloom story gets interrupted. It is well known to mental health professionals that this time of year more people express depression and hopelessness. The raised expectations of Happiness Hype Christmas have not opened ears to joy but caused deafness. With the lack of sunlight in many countries, the long winter months still ahead, who does not feel a little hopeless and helpless at this time? How did those three Zorastrian astrologers react when they first saw a new star? It compelled them. Something stirred in them like underground crocus corms respond to the change in light after the winter solstice. It compelled the Magi to such a degree that they undertook a long and difficult journey. There must have been times when they dragged themselves on, star unseen and almost forgotten, not certain of where they were going or what they would find. The focus of a winter journey for many souls is bare survival. To where is he dragging this wind instrument of disproportionate size? Where will he find an Energy great enough to sound that trumpet?Sometimes even hope is a burden too heavy to carry. The Wind “that listeth” must be enlisted, a very big wind, a Breather with powerful breath and arms stronger than iron nails. That trumpet shall sound… then shall the ears of the deaf be unstopped. 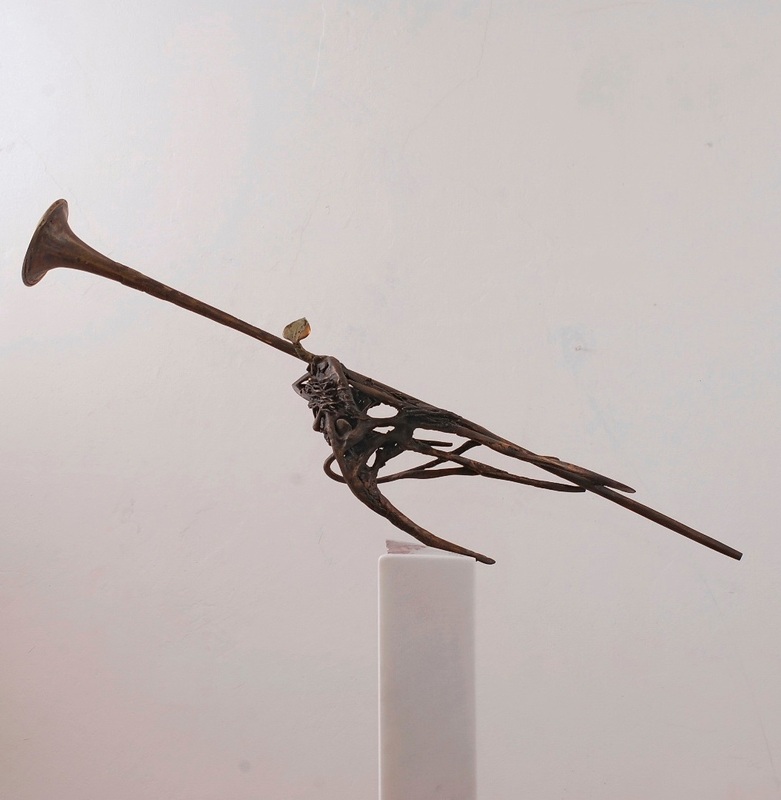 Liviu Mocan: The Spring, 2013, 172 x 27 x 21 cm, bronze, marble of Moneasa. Liviu Mocan is a Romanian sculptor. He was born in 1955 in Cara, a village in Transylvania. He studied at the ArtAcademy in Cluj-Napoca,Romania, followed by post academic studies in the U.S. In 1995, under the atheist communist government of his country, he started to understand, love and follow Jesus Christ. Since that time he values the fact that he is a creation higher than the fact that he is a creator. Sculptures become for him his altar, his prayers, his tears, his joy, his spiritual exercises of understanding God, the world, beauty and himself. His main artistic preoccupation revolves around matters of resurrection in large series of work such as Seeds, Pillars, and Vertical Libraries. ‘I am striving to polish mirrors for heaven,’ the artists says. Website: www.liviumocan.com. Hannah Main – van der Kamp also wrote the poem ‘Excrucielsis’ about Liviu Mocan’s The Spring. To read it, click here.